Advantage Graphics can design and print your letterhead and envelopes on a variety of paper types and in a wide range of colors, including full color. 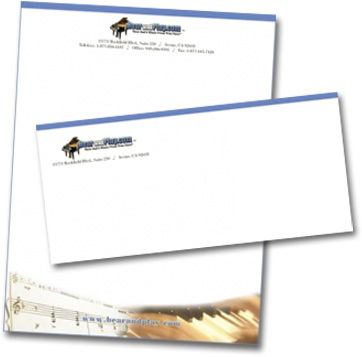 Need letterhead today? We can print small quantities quickly on our in-house color digital printer. Or, if you need matching stationery, we have a number of different ways to meet your budget and printing needs. Envelopes are available in a wide variety of sizes, from standard #10 business size envelopes, to custom-sized announcement envelopes. We can print in full color, black and white or spot colors. Just let us know what you need! Call us at 253-939-3812 for a quote, or use our online Quote Request form.